It’s that time of year again, Christmas movie time. 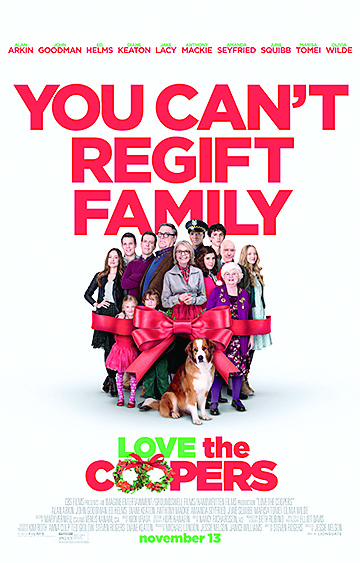 The first to hit theaters is Love the Coopers. Watch the trailers and what you see is a funny group of amazing actors and actresses. You instantly want to see the movie just based on its cast. How can you go wrong with Diane Keaton, John Goodman, Alan Arkin, Marissa Tomei, June Squibb, Ed Helms, Olivia Wilde, Amanda Seyfried, Anthony Mackie, Alex Borstein with Steve Martin as the narrator? 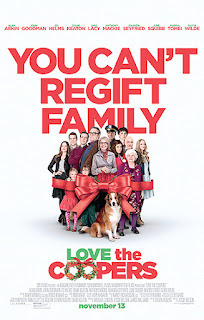 Well as good as the cast is this will not be the top Christmas movie of 2015. The cast does an amazing job, but lacks a unique plot or story to follow. I tip my hat to Diane Keaton and John Goodman as they really carried this movie. Whenever the story veered off course they brought it right back in. Unfortunately there was not enough plot to hold it together as a must see. The movie begins with Keaton and Goodman, on the edge of divorce trying one last time to bring their family together. They have been married for decades and Goodman just wants to fulfill his dream of going on vacation to Africa while Keaton wants to stay close to her grown up children. While Keaton and Goodman plan for the arrival of their children for Christmas the narrator takes us through the lives of each of their children as well as Keaton’s dysfunctional sister who spends most of the movie in a cop car. This movie spends a lot of time in little mini dramas that all add up to the entire family coming together for Christmas and finding out that their worst nightmares are now their best memories. This is a movie for anyone who has that dysfunctional family and can relate to holidays being their worst nightmare. If you are a Goodman or Keaton fan this is a must see but don’t expect King Ralph or Baby Boom.